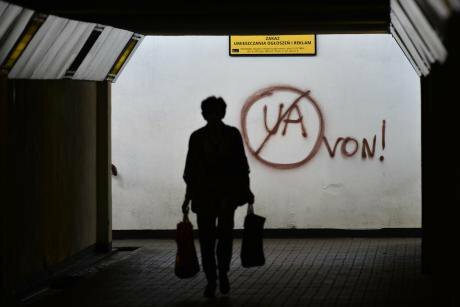 “UA [Ukrainians] out!” reads this graffiti in a pedestrian underpass in Czerwony Pradnik, Krakow, Poland. Photo (c): Artur Widak/SIPA USA/PA Images. All rights reserved.If you begin your visit to Poland from Warsaw Central Station, you may think you’ve found yourself in a western European metropolis, no different from Paris or London. Here, you can buy sushi rolls and a kale bioshake — a lunch fitting for the ride to Berlin on the hipster-filled Friday train. On the platforms, white-collar workers await their trains. When panic over air pollution gripped the city, they switched from SUVs to public transport. 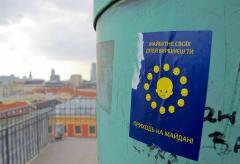 “Choose your children’s future: come to the Maidan!” reads this sticker near Warsaw’s Old Town in 2014. Photo (c): Maxim Edwards. Anna is an energetic cheerful woman in her fifties. In Ukraine, she worked as a geography teacher, but after the currency crash, the monthly paycheck of a Ukrainian teacher averages about $75. In Poland, Anna earns around $400 and has also room and board. Thanks to this she is able to transfer most of her earnings to Lviv, where she left her husband and two daughters. According to estimates of the National Bank of Poland, only nine percent of Ukrainian migrants in Poland have no secondary or higher education, but as many as 70.7% perform physical labour. Anna's friend Yulia was less lucky. 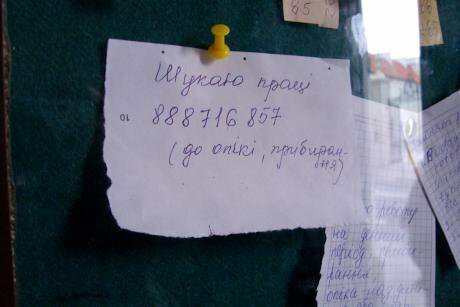 Back in Ukraine, Yulia bought a “vacancy”, a declaration from an employer needed to acquire a visa, from dishonest agents. She was convinced that once she arrived at Warsaw West she would be greeted by employers and transferred to the promised apartment. This isn’t what happened. According to reports of the Halina Nieć Legal Aid Center, the number of victims of human trafficking in Poland reaches several hundred every year and includes a growing number of Ukrainians. It is difficult to estimate how many cases of modern-day slavery (including forced labour trafficking) remain unreported. I met Anna and Yulia in the infamous queue at the Department of Foreigners of the Provincial Office. The Ukrainian internet is filled with memes about Polish bureaucracy, and one can see why: the queue forms at six am, two hours before the office opens. This is the only way to regulate issues connected with migrants’ stay in Poland. The Polish administration was not prepared for a sudden rise in the number of immigrants, and the anti-immigrant political climate does not favour implementing revolutionary improvements to ease their burden. Svitlana is a representative of the young Ukrainian intelligentsia that is starting to make its presence known in the cultural life of Warsaw. She worked for a year in the Russian-language branch of Polish Radio. But with the advent of the new Law and Justice government, the Polish Radio External Service has become a propaganda channel, with little tolerance for pluralism. Just like the Polish-language editorial teams, many journalists with liberal views have been fired or resigned. Previously, young educated Ukrainians found their place in Polish cultural institutions, think tanks or NGOs. Today, state institutions are becoming strongly political, and NGOs that support migrants or intercultural dialogue have fewer chances of receiving government support. Funds that were previously directed to initiatives for migrants are now spent mostly on “repatriation” — the resettlement of Poles deported to the Soviet Union, particularly those under Stalinism. Was Stepan Bandera a good person? The situation of Ukrainians in Poland under the PiS government has been impacted not only by anti-immigration policies and the “Poland first” approach typical of the populist right, but also by tensions in Polish-Ukrainian relations. Typically for the bloodlands of Central Europe, this is about memory conflicts. Ukrainians themselves are not eager to comment on the political changes in Poland. They try to be good sports, talking about cultural similarities and mutual understanding. Yulia, the woman who escaped from the gas station, underlines at the beginning of our conversation that she will talk with me only because I am writing for an English-language publication. She would prefer not to complain in Polish media — she doesn’t want Poles complaining about ungrateful and hostile Ukrainians. “And it needs no explaining,” Yulia says “who benefits from conflict between our nations.” She means, of course, Russian propaganda. Stepan Bandera, one of the leaders of the Organisation of Ukrainian Nationalists during the Second World War, is a contentious figure for Polish and Ukrainian historical politics. For some Ukrainians, particularly in western Ukraine, Bandera is a symbol of guerrilla warfare against Soviet and Polish hegemony, an example for some soldiers fighting today in Donbas. From the Polish perspective, Bandera is above all a symbol of the Volhynia massacre, the mass killings of Poles by Ukrainians (and, on a smaller scale, Polish retaliation), which took place in 1943–1944 under German occupation. 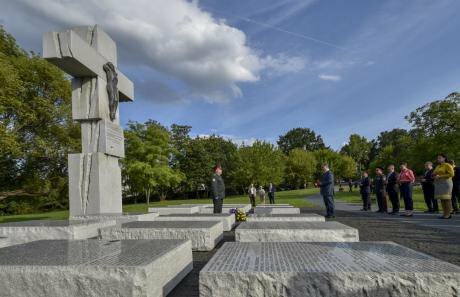 Kiev has made a few gestures of reconciliation relating to Volhynia — for instance, in July 2016 president Petro Poroshenko paid homage to the victims of the massacres. But Poland demands unequivocal condemnation of organisations like the Organisation of Ukrainian Nationalists or the Ukrainian Insurgent Army. Meanwhile, for Ukraine, now in a period of war mobilisation, this is not the best time for dealing with difficult history, even more so given the fact that the figure of the cruel “Banderites” plays a prominent role in the Russian propaganda machine. Poland’s “eastern policy” has two broad traditions that crystallised in the interwar period. The first (called piłsudczykowska, after Piłsudski, the leader of the independent left) assumes supporting Ukraine to counter the risk of expansion of Russian influence closer to Polish territory. The other one (called endecka, from the nationalist movement of National Democracy) treats Ukrainians as eternal historical enemies against whom even alliance with Russia is acceptable. Since Ukraine gained independence in 1991, the Polish political scene has been dominated by a Piłsudski-school consensus. But today, Poland’s “National Democracy” tendency is also making itself heard. Poland's Prime Minister Beata Szydło and Jarosław Kaczyński, chairman of Prawo i Sprawiedliwość, have claimed they cannot accept refugees from the Middle East because the country is already burdened by people migrating from Ukraine. (c) Alik Keplicz AP/Press Association Images. 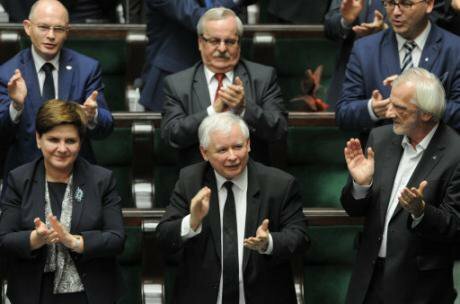 All rights reserved.The Prawo i Sprawiedliwość party itself is not decidedly anti-Ukrainian. Officially, it supports Ukraine in its conflict with Russia (although declarations are not followed by concrete action), and there are no significant clashes on the subject of Volhynia between Warsaw and Kiev. Members of the PiS government are also aware of the benefits of the immigration from Ukraine, which they sporadically express in the media. According to the Polish Union of Entrepreneurs, over the next 20 years Poland will need an additional five million people in order to maintain the current level of economic growth. However, fearing its most radical voters, Prawo i Sprawiedliwość does not want to appear enthusiastic towards Ukraine or Ukrainian workers. The anti-Ukrainian fraction in the party is also growing stronger. The situation is slightly similar to that in Hungary, where the ruling right-populist party Fidesz was forced to adopt the agenda of the far-right Jobbik party in order to prevent the strengthening of the opposition from the right. Poland’s ruling PiS party doesn’t inflame anti-Ukrainian sentiments itself, but turns a blind eye to xenophobic attacks. This creates conditions for hatred to thrive. In this sense, Prawo i Sprawiedliwość does not inflame anti-Ukrainian sentiments itself, but turns a blind eye. As xenophobic attacks are not condemned by the members of the ruling party, it creates conditions under which such hatred can thrive. And such incidents, as the Polish Ombudsman alarms, occur growingly often, even though Poles' attitude towards Ukrainians is, on the whole, much better than their sentiments towards Arabs or Roma people. The “stealing jobs” argument typical for immigration countries can also be found in the Polish debate. Recently, in one of eastern Poland’s car factories, employees on strike were informed that they would be fired and replaced by Ukrainians. Despite the fact that, in Poland, unemployment is currently at a record low (around eight percent), it can be expected that feelings of rivalry with immigrants will grow among low-qualified workers. Nationalist politicians and journalists are eager to use this frustration, spicing it up with xenophobic undertones and playing on anti-Ukrainian sentiments. Ukrainians in Poland are also irritated by the slogan about “one million Ukrainian refugees”, which is often repeated on the international scene by representatives of the Polish government. Prime Minister Beata Szydło and Jarosław Kaczyński, chairman of Prawo i Sprawiedliwość, have been trying to convince EU states that they cannot accept refugees from the Middle East because they are already burdened by those from Ukraine. “We feel, to put it colloquially, as if someone wiped their arse with us,” the Ukrainian sociologist concludes. Since the events of EuroMaidan, just 20 Ukrainians have received refugee status (and 18 of them only after appeal). Even though many Ukrainians came to Poland directly or indirectly because of the war, being granted international protection verges on the impossible. Ukrainians do not benefit from Poland’s social care system, even though they contribute to the country’s economic development and pay their taxes. If the Polish government does not give Ukrainians a clear sign that they are safe and welcome here, they will leave as soon as Germany opens its labour market. And Poles will be left alone in their “Europe”. Translated from Polish by Aleksandra Małecka. Europe’s refugee crisis has affected Russia and Ukraine in different ways — solidifying local hatreds, local hierarchies and varying views of European identity.